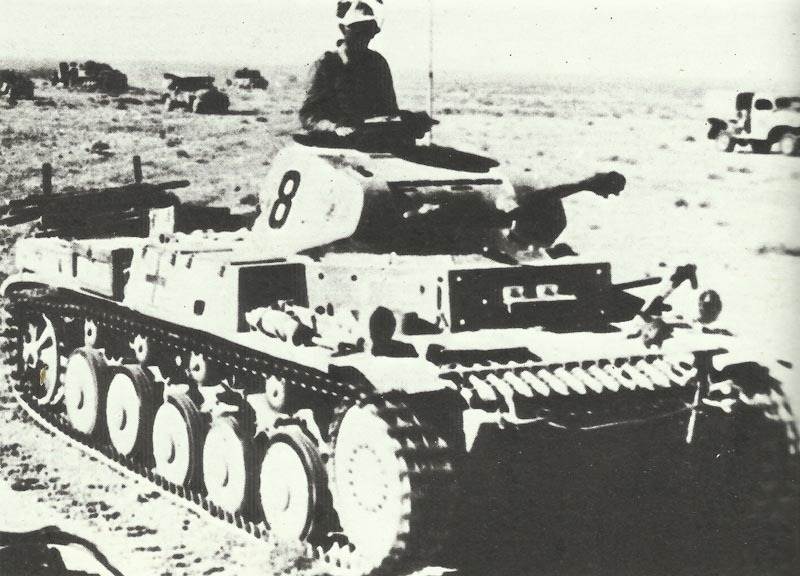 Panzer II of Afrika Korps moving through the desert. The final model of the development series of the Panzer II was the Ausf c, which bore the external features that came to be recognized as the standard design for the Pz Kpfw II. The Ausf c retained the 13mm armour of the Ausf b. Ausf a and b were in fact not more than pre-series produced in greater numbers (75 resp. 25 vehicles). The Ausf A was the first production series of this main model Ausf. c and was built from July 1937. The Ausf B was produced from December 1937, the Ausf C, from June 1938. With the Ausf c, the suspension was changed from six small road wheels to five independently sprung larger dia­meter road wheels, and the number of return rollers was increased from three to four. The track design was changed (which meant that the drive sprockets had to be modified) and wider fenders and idler wheels were installed. The ventilation and cooling of the engine compartment was again improved. The final drives and epicyclic steer­ing system on 25 of the Ausf c were manufactured from an ‘Ersatz (substitute) molybdenum’ steel. The last major change in the Panzer II series was the introduction of an improved transmission in the Ausf A (sub series of c). There were only minor differences (mainly changes to the vision ports) between the Ausf A, B, C (there were a total of three sub-series of Pz Kpfw II c). As originally produced, all the Pz Kpfw II Ausf c, A to C had a split hatch on the turret roof for the commander, and a rounded hull front. The Polish anti-tank rifle could easily penetrate the 15mm armour of the Pz Kpfw II and the troops requested that it be strengthened. 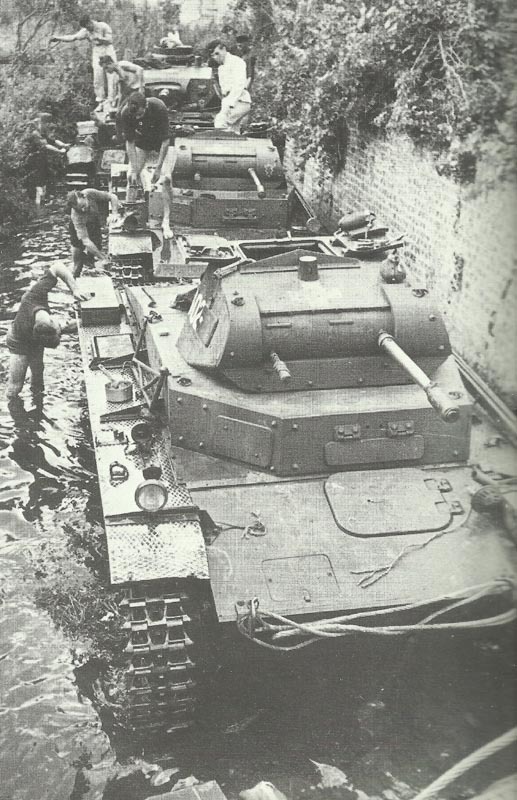 Washing Panzer II c in a stream. The first vehicle has additional armour plate bolted to the hull front. The second vehicle is an Ausf A, with different driver’s visor and vision ports. By May 1940, additional 20mm armour plates had been bolted to the front of the turret, superstructure and hull front of approximately 70 per cent of the Pz Kpfw II Ausf c to C, and the armour of the remainder had been increased before the invasion of Russia. During the campaign in Poland, commanders had complained of limited vision, and had registered the same complaint during the campaign in the West. From October 1940, this defect was remedied by the provision of a kit with eight periscopes for the commander’s cupola. The first Panzer II (Ausf a) were first issued to Panzer units in the spring of 1936. They retained their main combat tank status in Poland, but were finally relegated to a reconnaissance and exploitation role during the campaign in the West. When the Russian campaign started, each Panzer Regiment, Detachment and Company had a platoon of Pz Kpfw II assigned for reconnaissance. In 1942, these platoons were withdrawn from tank companies. The Panzer II was phased out of service with tank regiments late in 1943, but remained in service with various Panzer units on secondary fronts until the end of the war. 1939 1,223 (1.9.) 246 ? Tagged 1939, germany, light tank.